This morning, we considered the catcher position. This afternoon, the positional power rankings take us out to left field. Has batted ball data and modern defensive positioning altered the defensive spectrum? 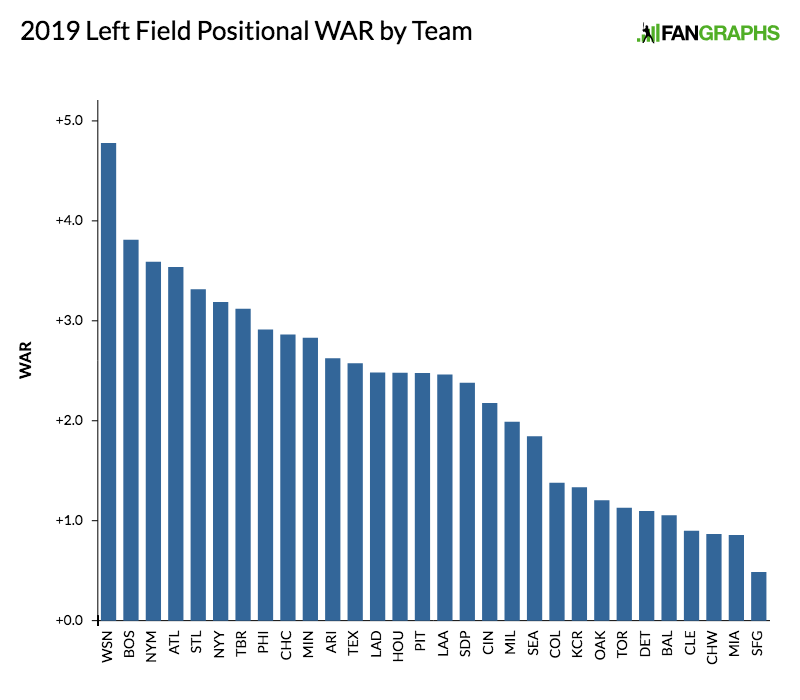 It likely won’t surprise readers to learn that the average wRC+ by position starts with first base and right field, but it may be revelatory to learn that the gap between right and left field has been pretty wide. The last four years, the average right fielder has produced an average wRC+ 4.75 ticks higher than his counterpart in left. The offensive bar at third base has also been higher on average than in left field during the last four years. Why? Perhaps improved defensive positioning on the infield has enabled more bat-centric players to play third base when, in years past, they’d be at first. Most hitters are right-handed, and increased focus on pulling the ball in the air could have quickly made defensive range in left field more important than it has been in the past. The average sprint speed among left fielders is now on par with that at shortstop. Is it a long term, tectonic shift that should impact things like prospect evaluation? It’s hard to say definitively at this point because so much about the game is changing and still has the potential to change. But it’s worth discussing — eventually. For now, here are our current left fielders. We hoped you liked reading 2019 Positional Power Rankings: Left Field by Eric Longenhagen! Very cool Eric, thank you!